When the challenge is to cut large plates, or thick stock in a variety of alloys, and routinely fabricate intricate, complex shapes…the solution from NTC America’s Laser Group (Novi, MI) is the TLX Series of gantry-type, 3-axis CO2 laser systems for two-dimensional cutting applications. The TLX machines are a combination of a rugged construction and high-powered laser energy that produces a cutting system tough enough for the harshest manufacturing environments. Yet, the TLX Series also features exceptional precision, and speed along with an operational package that blends all of its productivity performance and power into units that are simplistic in their programming, setup and operation. In addition to meeting high performance requirements, including fast processing times, accuracy, reliability from its solid machine tool construction, the TLX Series has been reconfigured with a design that places the laser and chiller components on the system’s gantry. This concept provides a smaller footprint and shorter beam path that results in space and labor savings, increased flexibility and greater edge quality in cutting operations. The TLX systems are, first and foremost, built for heavy duty, rigorous fabrication jobs. Within the series are four standard gantry-style machines that provide working strokes from 10.5′ x 46.25′ (3,200mm x 14,100mm) up to a massive 15′ by 100′ (4,550mm x 30,500mm), and with approximately 8″ of vertical Z-axis travel. A fifth unit in the series is a cantilever model that provides an envelope of 8.5′ x 20.3′ working strokes. The TLX Series has three power options available including 3.3kW, 4.0kW, 5.0kW and 6.0kW produced by dependable fast axial flow, DC excitation lasers that deliver consistent energy strength and beam quality. The TLX lasers provide high-speed performance for short cycle times and fast throughput. Rapid feed rates of up to 1,181″ (30,000mm) per minute, X & Y axes, and to 393″ (10,000mm) for the Z-axis position the beam quickly, while cutting speeds of up to 393″ (10,000mm) per minute are possible. These speed ranges are coupled with precision motion that spans just +0.004″ per 12″ (+0.1mm per 300mm) of travel. This accuracy is the result of AC servo motors, linear guides and rack and pinion systems built for the heaviest-duty models that give each model high strength and rigidity throughout the full range of travel. The TLX lasers also have an exclusive drive system that isolates incidental motion from the beam delivery system to provide virtually vibration-free optics for precision cutting at high speeds. The TLX models incorporate a fast-response gap sensor to monitor optics-to-material distances and an auto focus option that can automatically adjust the laser focal point to compensate for various material thickness while maintaining optimum pierce and cutting quality. Additional features include a Fanuc CNC controller that enables instantaneous and simultaneous movements of all three axes to generate smooth cutting action through a full range of part geometries and shapes. The control functions are balanced with NTC-developed, laser specific software with built-in subroutines and cutting parameter library for circle, arc and linear interpolation, to simplify mirror imaging and scaling, provide automatic skew compensation, part program storage and recall, and comprehensive diagnostics. 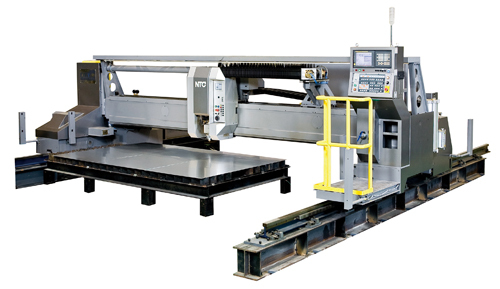 In addition to the TLX Series of laser cutting systems, NTC America’s lineup of laser products includes the TLZ Series of 2-dimensional, 3-axis systems with flying optics, the TLV Series 3-axis hybrid machines for large, wide workpieces, and the TLM Series of high power CO2 machines with bridge-type construction and 5-axis control for precision cutting and welding of 3-dimensional workpieces. With working sizes of up to 15 feet by 100 feet, positioning accuracy of +.004″ per 12″ of travel, cutting speeds of up to 393″ per minute, laser powers to 6.0kW, and shop-tough construction, the TLX Series laser cutting systems from NTC America are ideal for most demanding fabrication applications.